After posting an announcement on the Nextdoor website about the existence of this humble website, I was very pleased with the interest and overall positive response by many of my neighbors (who are also users of that system.) Among the many comments received was one from Nancy Hannet which offered the source photo for the image to the left and the words "An older gentleman who lived in Oaklandon all his life gave me this paper." I could only make-out the title and the fact that there was a map so I reached out to Nancy to discover the author's name and any other clues that might lead me to a copy I could examine. Knowing only the name Victor Harris and guessing it to be an article from the (now defunct) Lawrence Topics Newspaper this article proved to be very rare indeed. Through Nancy's neighborly generosity, I was able to scan her xerox document and thereby present the article once more to the public, in an effort to assist the late Mr. Harris in his stated purpose for writing this historical thumbnail sketch of Oaklandon. The available copy of this article unfortunately had the right-most edge clipped in the duplication process so I have been forced to reconstruct these lines based on the available context. In the transcript that follows these edits have been placed within square brackets ("[" & "]") so the reader may decide if this effort was successful or not. In honor of Old Oaklandon Days, a little history of Oaklandon might be in order. I can write only about those things that I know about firsthand, but here are some memories, a bit of history and a tour through Old Oaklandon. Turn off Pendleton Pike and go north on Oaklandon Road to Fire Station No. 3, then northeast on Broadway until it joins Pendleton Pike again. You have just traveled Pendleton Pike as it was up to the 1930s, At that time, the bypass around Oaklandon was constructed. In order to locate things of interest, go back to Pendleton Pike and turn north on Oaklandon Road. The large building on the northeast corner was Howard Hauser's automobile agency. The next building was AFNB/Bank One. The shopping center on the west side of the road is in the outfield of Oaklandon High School's former baseball diamond. The Oaklandon School building stood on the high ground just north of the shopping center. It was a 2 1/2-story building housing all 12 grades. Class sizes were 15 - 20 pupils. The second house north of the bank building on the east side of Oaklandon Road was Erbin "Mickey" McCord's mortuary. My mother was buried from this mortuary in 1956. Mickey and wife Elsie were fine, compassionate people and friends to everyone. Across the street and a little further north is a tall, red brick house. This was Dr. Kneer's family residence and medical office. His family practice included all athletics examinations. Later on, Dr. Joe Miller had his office in this same building. Travel further north to the barber shop. This has been a barbershop ever since I can remember. For years, John McGinnis and his family resided there, and his shop was in the front room, same as it is now. Across Oaklandon Road are the two churches. The frame church was the Oaklandon Christian Church until the congregation moved into its new building across from Oaklandon Elementary School. The yellow brick building is the Oaklandon Universalist Church. Many of the high school functions were held in this church, since it had a larger stage and greater seating capacity than the high school auditorium. I received my high school diploma in this church. Directly west of the Oaklandon Universalist Church was the grain-elevator office, and further west was the elevator itself. Farmers hauled corn and other grain here for unloading and sale. The vacant lot next to the church used to be a poolroom. This building was destroyed by fire and never rebuilt. The next building north was Mickey McCord's confectionery. He sold over-thecounter drugs and candy, and would even whip you up a hamburger, hot dog or bowl of soup. Later, on Maynard Bough's drug store occupied this building. The next building (now Dave's Market) was Hobart Weaver's feed store. You could buy hay, straw and ground feeds for all farm animals, as well as other farm supplies. In the parking lot of Dave's Market, you can see remains of the foundation of Everet Harting's gas station. We will return to this point on Oaklandon Road in a moment, but for now let's travel up Broadway beside Fire Station No. 3. On the right, the large building was Leigh Fisher's Chevrolet dealership. Later, it was Howard Hauser's auto repair. Travel northeast to the first house on the left (located in the southeast corner of the Play Park). This was the Oaklandon telephone exchange. Mrs. Negley was the operator, and at that time the phones were magnetic crank instruments. Just west of the telephone office was a blacksmith shop, where Adam was the blacksmith. The little red brick building just northeast of the telephone office was the original Oaklandon Fire Department. I know, when you look at that little building, you will think I am mistaken, because a large passenger car would hardly fit in the building today. Going back to Oaklandon Road, the American Legion Building was just [north of] where Dave's Market now stands. This building was destroyed by fire and [was never] rebuilt. As we get to the railroad, on the [left] was a small storage building for the [rail]road. Mail personnel would hang the [mail] bags on an arm alongside of the track [and] the mail car would pick up the bag [while the] train was in motion. The red brick building on the [north side] of the tracks was the Oaklandon State Bank. Assistant cashier Edgar Mock remembers this building only too well. [He] remembers the bank being robbed one [day] and so many people came running [out with] firearms that the bandits were caught a quarter-mile down 63rd Street in an [abandoned] building. Next to this building is the [foundation of] the O.W. Mohler & Son grocery. The [post] office was in the southeast corner of [the] store. Upstairs in the building was [the Independent] Order of Oddfellows (IOOF) [lodge.] Leslie and Helen Mohler ran this store [for] many years. Down 63rd Street stands the new [Masonic] Hall. Between the new building [and the] house on the corner of Oaklandon [Road] stood the old Masonic Hall, which [endured] for more than 100 years. It was torn [down] after the new building was completed. Back on Oaklandon Road, as you [travel] north past the houses on either side, [notice] the utility poles in each direction from [the] road. This was the old interurban line. [The] station was on the right side of [road.] You bought a ticket and the station [manager] would turn on a red light, signaling [the] interurban operator to stop for [passengers.] The interurban traveled along the [railway] down to 38th Street, followed 38th [Street] along the north side to Fall Creek by [the] State Fairgrounds, and continued on [Martindale] and into the station (now the bus [station]). It controlled the stoplights so [one] could travel from Oaklandon to the [State] House in about 20 minutes. Interurbans were powered by overhead electrical [lines] and sped along at about 70 mph. [Lines] extended in all directions from [Indianapolis.] Oh, what modern-day people would [give for] such a mass-transportation system! Looking to the north, on the left is new Oaklandon Elementary School. On the right is the new Oaklandon Christian Church. For old-timers in Oaklandon I [trust] this article has brought back a few [pleasant] memories. For our new friends, [maybe a] little bit of history will help you [appreciate] your community a little more. 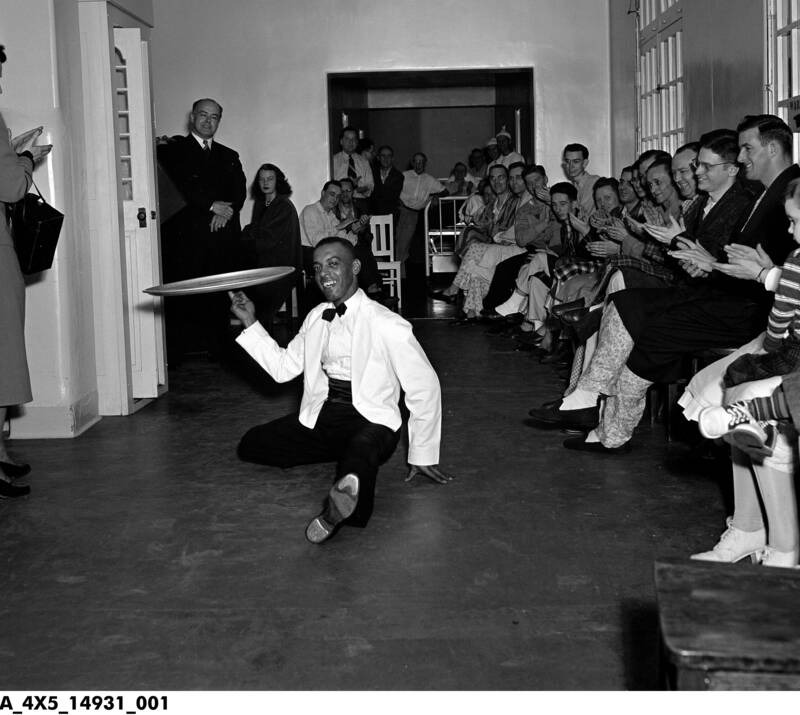 George Gibson, "the Dancing Waiter" entertains patients at the Sunnyside Tuberculosis Sanitorium, also called the Marion County Tuberculosis Hospital. The sanitorium was located on Route 12 (now 36) northeast of Indianapolis in an area called Oaklandon. Though tuberculosis had previously been treatable only through surgery, the antibiotic streptomycin became available in 1946. Gibson performed in the United States and Europe for decades, and appeared on the Ed Sullivan Show, the Milton Berle Show, and more. At the northeastern edge of Marion County, just a few miles past Lawrence and just a step from McCordsville and Hancock County, you’ll find the small community of Oaklandon. Back in 1849, the now-deceased John Emery laid out a small village northeast of the state capitol. Originally called Oakland, it was changed to Oaklandon around 1870 when they got their post office … and the first "Oakland” in Indiana objected to a second "Oakland.” So we add an "on” and we’re set to go. In the early years, the town fostered a sense of community, with strong churches, lodges and local businesses. There was plenty of space to stretch out, yet it was close-knit. 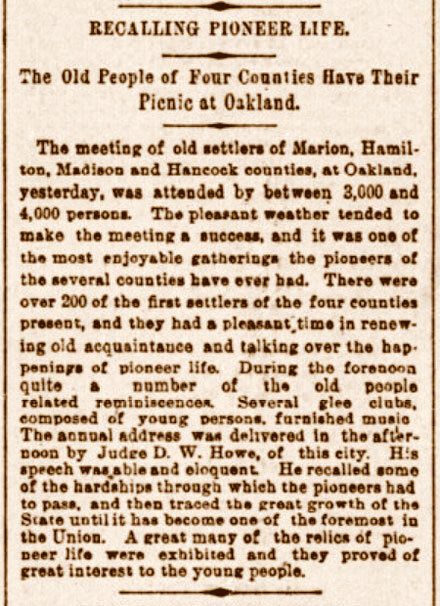 Throughout the late 19th and early 20th centuries, there are stories of town bands that were very well-known, playing in their own Oklandon bandstands and other area events, even the Indy 500. By the 1920s, Oaklandon was beginning to be more suburb than town. Never incorporated as a true town or city, the new State Road 67 (built past, not through Oaklandon) made commuting to Indianapolis an easy task. An interurban line took that a step further. Interesting story (directly quoted from A History of Oaklandon, The Lawrence Chamber of Commerce): A 1927 feature story in The Indianapolis News explains why there were no saloons in Oaklandon. About 1887, the women of Oaklandon apparently organized a branch of the Women's Christian Temperance Union, an organization that included a campaign against alcohol. Their target was the lone saloon in Oaklandon. Adeline Apple, 83, was interviewed. The feature story said, "Mrs. Apple, with a twinkle in her eye, tells how she and the other women went into the saloon unannounced one night and sat down, much to the consternation of the men who soon took to their heels. 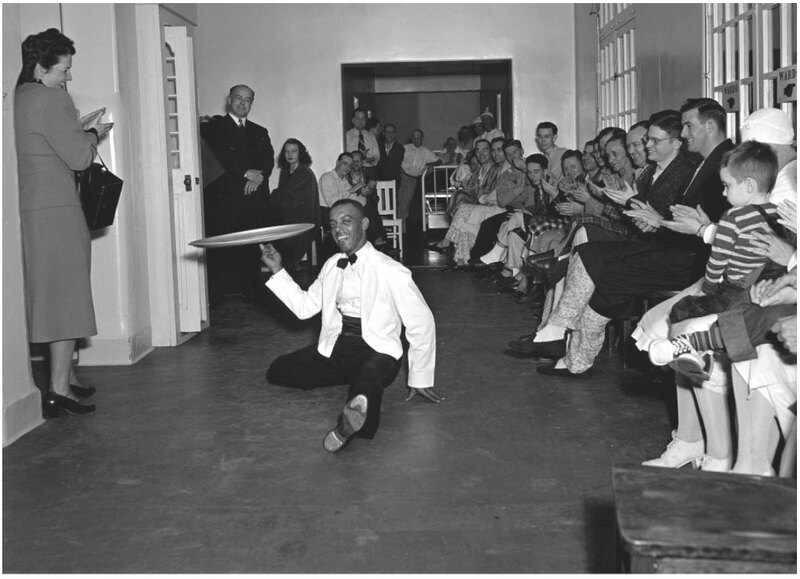 The second night, she said, the saloonkeeper had hoped to prevent their staying by having all the chairs taken out. The women, undaunted, stood around the stove. "The nightly visitations of the feminine contingent destroyed business and the saloon soon disappeared according to Mrs. Apple,"
After the second World War, Lawrence and Oaklandon found themselves even more a suburb of Indianapolis. Lawrence, a city, started actions to annex Oaklandon. Oaklandon objected, sued, fought and got all riled up, but Lawrence finally won out in 1976. Today, the Oaklandon community maintains an identity, with a bright "Oaklandon” water tower, its original Oaklandon Road and a few small monuments celebrating the one-time village, now suburb. The community of Oaklandon is celebrating its 150th birthday in 1999. 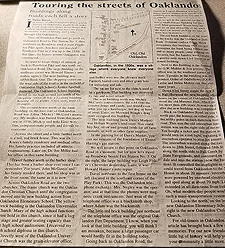 Oaklandon was platted just months after Lawrence, but the community took a different direction, possibly due to its location, an additional 4 miles from Indianapolis. John Emery platted the village first called Oakland, a named suggested by a man identified only as "Dr. Moore," according to Indianapolis and Marion County Historian B.R. Sulgrove. As in Lawrence, it was the post office that led to the final naming of the community. Oaklandon Historian Steven Hamilton noted that when the post office was moved from Germantown to Oakland in 1870, the name Oaklandon was selected. Eventually, the mail address determined the community's name. Sulgrove painted an unflattering portrait of the community in his 1884 volume. He wrote that "the streets have never been improved and many of the houses are in a dilapidated condition, and the village presents the appearance of age and decay." Paul Hamilton replied to Sulgrove's assessment in a history of Oaklandon published in 1972. Hamilton wrote, "Even though the historian B,R.S, (Sulgrove) referred to the dilapidated condition of many houses in 1884, some senior citizens of today recall that there were many attractive houses and home sites in Oaklandon during their growing up years,"
Had Sulgrove spent time in the community and met some of the residents, he might have gained a very different perspective. Accounts of Oaklandon highlight strong churches and fraternal organizations, its doctors, the bankers, the undertaker and the proprietors of the various general stores. Even the undertaker is remembered. For its small size, Paul Hamilton reported, the village was scarcely without a town band, orchestra or both in the years leading to school-sponsored music organizations. A bandstand - two stories high - was located prior to 1916 at the site of the Oaklandon State Bank, at 63rd Street and Oaklandon Road. A second ground level, open bandstand stood until the late 1920s further south on Oaklandon Road. Lifelong resident Victor Harris noted that Oaklandon contributed mightily to an area wide Odd Fellows Lodge band that used to play annually at the Indianapolis 500 Mile Race. A description of the community from the 1914 Oaklandon High School annual had this to say: "The village contains a few streets and about 75 houses. An excellent feature of the town is that no one is crowded for room. Every family has plenty of room for gardens and truck patches. The town affords three large lodge halls and more stores in general than are needed, yet they furnish plenty of good loafing places for a number of Oaklandon citizens. Besides these, there are four barbershops, a livery barn, a bakery and two general repair shops. Unfortunately, the town possesses neither saloons nor gambling rooms. However, in nice weather some of the most prominent men convene on the south bank of the railroad behind a large signboard to have a nice quiet game of poker. When they need something to quench their thirst, they can board an interurban car at any hour during the day bound for the city." A 1927 feature story in The Indianapolis News explains why there were no saloons in Oaklandon. About 1887, the women of Oaklandon apparently organized a branch of the Women's Christian Temperance Union, an organization that included a campaign against alcohol. Their target was the lone saloon in Oaklandon. Adeline Apple, 83, was interviewed. The feature story said, "Mrs. Apple, with a twinkle in her eye, tells how she and the other women went into the saloon unannounced one night and sat down, much to the consternation of the men who soon took to their heels. 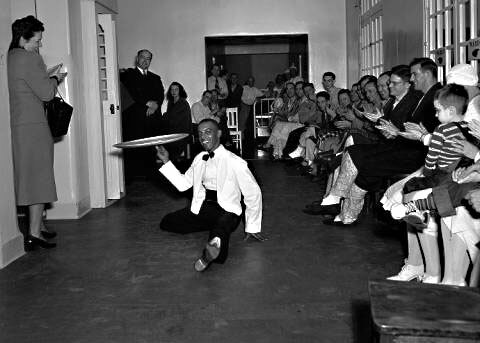 The second night, she said, the saloonkeeper had hoped to prevent their staying by having all the chairs taken out. The women, undaunted, stood around the stove. "The nightly visitations of the feminine contingent destroyed business and the saloon soon disappeared according to Mrs. Apple." The feature story further described the community: "Oaklandon has no industry and no motion picture show. But it has two churches, two groceries, a garage, a funeral director, a bank, an elevator, a feed store, and a restaurant. Barbershop and two filling stations in the town. There are four additional filling stations on Road 67 (Pendleton Pike) that sidestepped Oaklandon when it graduated into the three-lane class." "Two new houses are being built by residents, who hope to rent the property they will leave. Houses are scarce, and some of the Army officers recently transferred to Fort Benjamin Harrison have rented stone or log cabins at the Paradise tourist camp, just north of town, on the main road." "Unemployment is at a minimum, also thanks to the war. For many residents of Oaklandon arc employed at the Allison division of General Motors Corp., and the International Harvester Co. in Indianapolis, or at Delco-Remy and Guide Lamp at Anderson." Referring to the interurban line, as well as Road 67 leading straight to Indianapolis or Anderson, the feature story ended, "Commuting is easy." The News also describes a blackboard on a wall of the Oaklandon State Bank - the only bank for many years in Lawrence Township -, which "served as a classified advertising medium at no cost to anyone." • Wanted - Young girl for housework. Mrs. Cooley. Wayside Gardens. • Fresh Guernsey cow. Five years old, Good flow milk. Ed Brooks. • Four-burner gas stove. Edna Glossbrenner. Unlike Lawrence, Oaklandon never aspired to be an incorporated town. There was never a town board or a police marshal. The community formed a volunteer fire department only after names destroyed several important buildings, including the Universalist Church, the livery stable, the Red Men's Hall, McCord's Restaurant and a confectionary. While fund raising for the volunteer fire department was a never-ending endeavor, Paul Hamilton reported contributions of time, money and materials resulted in a sidewalk along Oaklandon Road in 1910, shortly after the high school was constructed. "It provided a fine walkway for thousands of schoolchildren's feet and a base for hundreds of miles of roller-skating,'" he wrote. Maintenance of the Pendleton Road - today called Pendleton Pike - was often a bother in Oaklandon's young days. Hamilton reported that when directors of the Indianapolis and Oakland Gravel Road Co. met in December 1872, they reported an income of $54 from the tollgate located on the southwest corner of the intersection of Pendleton Pike and Oaklandon Road. Hamilton said this about the 1920s paving efforts: "The Oaklandon community certainly deserved a good break sometime from the highway builders because the community suffered greatly from the paving of Road 67. "Before paving, the road rounded the corner in front of the Legion Hall and then turned back northeast at the Oaklandon Telephone Building. Somehow, the engineers did not properly plain the drainage, and then the state and county road men never corrected the matter; and the present 'Canal Street' resulted." Today, that street is known as Broadway. The first interurban service to Indianapolis came in 1900 from the Union Traction Co. Later, the Indiana Railroad Co. ran it until the last car was run in January 1941, according to Hamilton. He said, "When one speaks of the last car, senior citizens are apt to think that means the one leaving Indianapolis Interurban Station at 11:30 p.m. and arriving at Oaklandon at 12: 14 a.m. Can't you hear the trainmaster calling: Lawrence, Oaklandon, McCordsville, Fortville, Ingalls... with Oaklandon having the accent on 'land' and not 'Oak' as the bus men later did it?" Residents of Oaklandon never wanted to be part of Indianapolis, let alone Lawrence. When Lawrence initiated annexation proceedings about 1968, Oaklandon residents objected. After many years in court, Oaklandon became part of Lawrence in 1976. 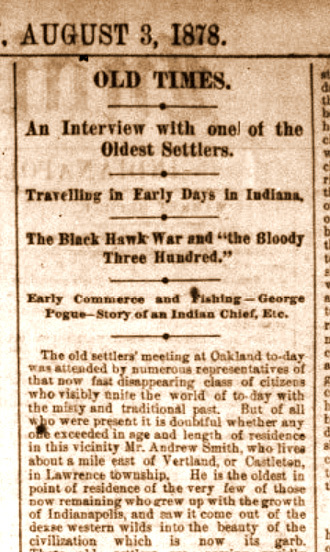 The Indianapolis Star reported nearly half of Oaklandon and Indian Lake residents would have rather been part of Indianapolis. Another story quoted Oaklandon residents as vowing to seek disannexation, but the action has stood. Lawrence has allowed Oaklandon to maintain its identity. The water tower with the name Oaklandon rises out of Play Park, erupting in bright colors like a hot-air balloon. At the northwest corner of Oaklandon Road and Pendleton Pike is a brick monument honoring in its inscription all the village desired to be: Oaklandon Community. 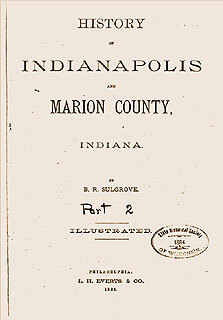 A detailed history of Indianapolis and Marion County, Indiana, from its settlement in the early 19th century. Covers general history, political history, business and industrial interests, social history, architecture and the history of each township within Marion County. The village of Oakland is situated thirteen miles from Indianapolis, on the Bee-Line Railroad. It was laid out June 18. 1849, by John Emery. The name Oakland was suggeted by Dr. Moore. The streets have never been improved and many of the houses are in a dilapidated condition, and the village presents the appearance of age and decay. Subsequent to 1849 John Mock, Andrew F. Cory, John W. Combs, and Enoch Hanna laid out additions. The first merchants were the firm of John W. & William Combs; the first practicing physician was James W. Hervey. The town has a population of about two hundred, and has a telephonic connection and a Western Union Telegraph office. The railroad company recently completed a commodious depot, which adds greatly to the comfort of the traveling public. The present merchants are David G. Hanna and Naaman C. Plummer, both of whom are dealers in general merchandise. Andrew F. Cory and Jeff. K. Heltman are the physicians, and Naaman C. Plummer is the postmaster. The name of the postoffce is Oaklandon. The town has three churches, —a Methodist, a Christian, and a Universalist. The last two named have a large membership and are well attended. The first named, however, is in a precarious condition. The village contains a graded school, and the Masons, Odd-Fellows, and Grangers have lodges located there. While looking for historical information regarding Old Oakland Golf Course I happened upon the following video that highlights many of the recent improvements made to the grounds. We've seen the heavy equipment there, now we know what they were up to.